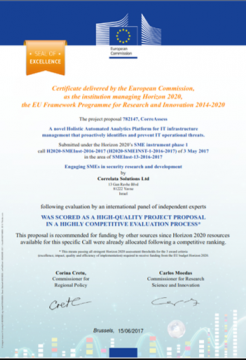 YAVNE, Israel - Oct. 29, 2017 - PRLog -- We are excited to announce that Correlata Solutions Ltd. has been awarded the Phase 1 grant from the EU European Commission Horizon 2020 Program SME Instrument. In this highly competitive program, following the evaluation by the international panel of independent experts, Correlata innovative solution was evaluated with top marks in all categories. "Being awarded this grant is a strong signal that we are on the right track and offer compelling and innovative solutions in the Data Center management domain that fit with the new Digital and Data distribution market demand" says Correlata CEO Ofer Laksman. "Correlata is guided by a simple philosophy – Thinking innovatively out of the box, combining with strong values and high ethical standards for the benefit of individuals and businesses worldwide." added by Ofer Laksman. Correlata's CorreAssass ™ is a Dynamic Vendor-Agnostic Analytics solution empowers Management and IT leaders – for the first time ever – with the clarity to quantify the true value and contribution emanating directly from IT to the business layer. This goes a long way toward delivering positive impact on cost and bossiness execution. Beyond that, it better ensures accurate, fast and seamless cloud migration without surprises. Correlata CorreAssess™ enables you to deploy a single tool that runs your entire Data Center business operations, helping you make informed judgement about critical management decisions, transforming IT into a profit center. Correlata CorreAssess™ solution provides a single dashboard for Senior Leadership, with our patented cockpit controls for IT Operations leaders. Through predictive analytics and machine-learning, we offer trend analysis, detailed data reporting while proactively identifying risks.